Dr Victor Kuncser, is currently a Research Professor at The National Institute of Materials Physics in Bucharest-Magurele (http://www.infim.ro), Head of the Magnetism and Superconductivity Department and a member of the executive board of the Institute. 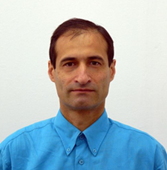 He is PhD promoter as Professor associated to University of Bucharest, Faculty of Physics. His previous appointments and research secondments include: Rostock and Duisburg Universities, University of Rouen, Padova and Zaragoza, Deutsche Synchrotron and Berlin Neutron Scattering Center. Victor received his PhD in Physics in 1995 at the Institute of Atomic Physics, Bucharest-Magurele and has been awarded the Alexander von Humboldt fellowship in 2001 and the prize of the Romanian Academy in 2002. Victor published more than 200 scientific papers in ISI quoted international journals, six book chapters and was coeditor of a Springer book. His scientific interest is in the field of magnetic interactions and local phenomena in intermetallics and oxides, molecular magnets, ferrofluids, magnetic nanocomposites, multifunctional and magnetofunctional materials, thin films and multilayers.